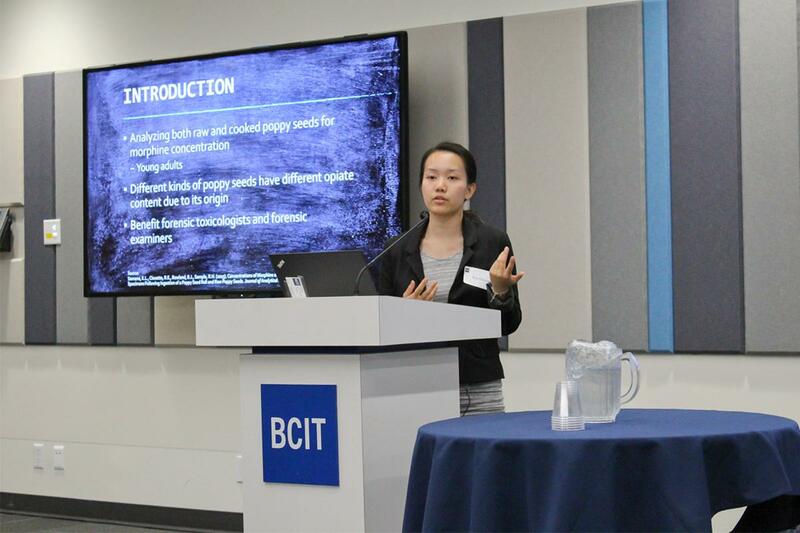 BCIT Bachelor of Technology (BTech) students presented their final projects for the Digital Forensics & Cybersecurity, Crime and Intelligence Analysis, and Forensic Science options on Graduate Research Day held at Burnaby campus last week. The projects are a culmination of many years of hard work and encapsulates all they have learned. The event also offers students exposure to industry professionals who attend, some to get an early peek at graduating talent. The students’ projects covered a wide range of research, such as the degradation rates of DNA, internet fraud targeting and victimization, lone wolf terrorism, border security, and many more. Nathalia Herrera Galeano conducted a study across Metro Vancouver using intrusive activities as well as dimensions of national cultures and gender empowerment to measure perceptions of stalking. Galeano found that the perception of stalking does vary according to a culture’s views on intrusive activities. During his research, Jason Chen found that the physical quality of latent fingerprints (not apparent to the eye) degrade over time when exposed to various environmental conditions. However, under certain conditions the quality level of latent fingerprints may be preserved for long periods. “The best approach for investigators would be to photograph fingerprints as quickly as possible to save them as reference,” says Chen. In her examination of morphine concentrations in urine from poppy seeds, Elia Cheung explored urine opiate pharmacokinetics by serving her participants cooked (baked into a muffin) and uncooked poppy seeds a week apart and testing urine samples. For more information on Forensic Investigation programs visit bcit.ca/cas/forensics/.